Assembly activity for the Flight VA224 Ariane 5 began with erection of its cryogenic core stage over the mobile launch table (photo at left), followed by the solid boosters’ rollout to the Launcher Integration Building (center and right) – after which, they were mated to the core stage. Another Ariane 5 has completed its initial build-up at the Spaceport in French Guiana, marking a major milestone in preparations for Arianespace’s third heavy-lift mission of 2015 – which will orbit the European MSG-4 meteorological satellite and Brazilian Star One C4 telecommunications relay platform during July. As part of regular pre-flight preparations inside the Spaceport’s Launcher Integration Building, the vehicle’s core cryogenic stage was first removed from its protective shipping container and hoisted into position over one of two operational mobile launch tables available for Ariane 5. During separate rollout processes, the vehicle’s two solid propellant boosters subsequently were then moved via rail on pallets from their dedicated on-site assembly facility to the Launcher Integration Building, and then mated with the core stage. 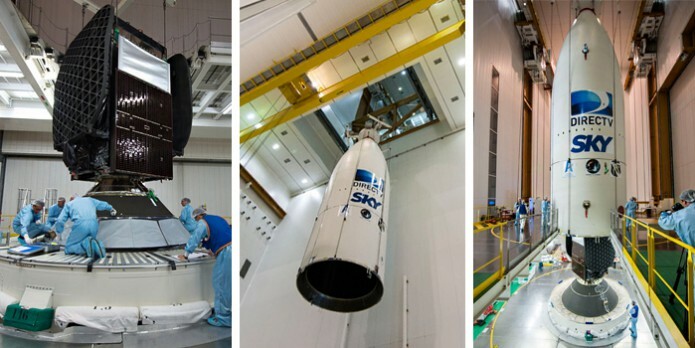 To complete the current phase of assembly activity, Ariane 5’s ESC-A cryogenic upper stage and vehicle equipment bay were installed yesterday as a single unit atop the Ariane 5’s cryogenic core stage. 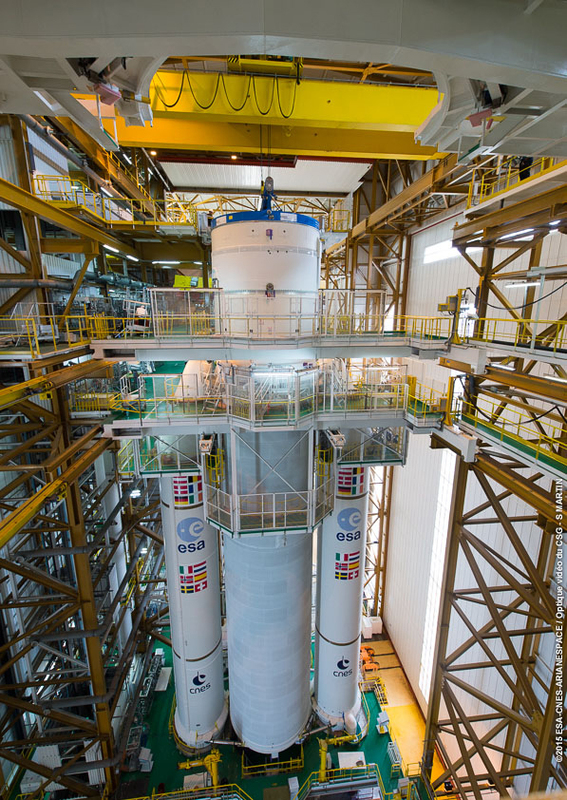 Ariane 5 is shown after completion of its initial build-up, with the combined cryogenic upper stage and vehicle equipment bay component integrated atop its core cryogenic stage. This Ariane 5 vehicle will be used on the 224th Ariane-series mission to date, correspondingly designated Flight VA224. 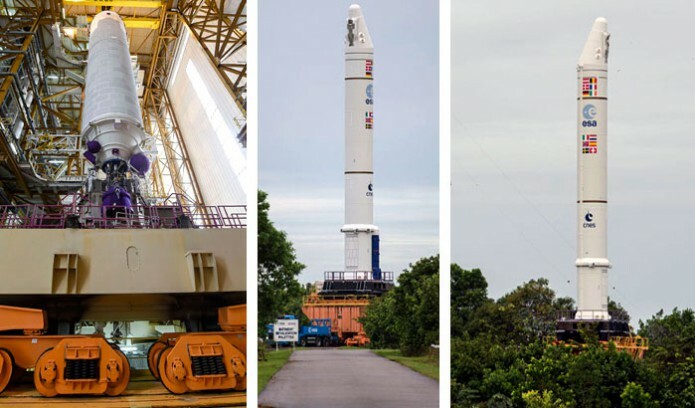 It also will continue Arianespace’s busy launch schedule in 2015, during which the company is targeting 11 missions in total – based on the availability of payloads – using its full family of the heavy-lift Ariane 5, medium-lift Soyuz and lightweight Vega launchers. Flight VA224 is one of three missions currently undergoing preparations in parallel at the Spaceport, joining Flight VA223 – which will orbit the DirecTV-15 and SKY México-1 satellites on May 27 using an Ariane 5; and Vega Flight VV05 with the Sentinel-2A Earth observation satellite for Europe’s ambitious Copernicus initiative – which is scheduled to lift off this summer. With the Flight VA224 Ariane 5’s initial build-up concluded, the launcher is now being readied for its transfer to the Spaceport’s Final Assembly Building – where it will be fitted with the MSG-4 and Star One C4 satellite passengers. Eumetsat’s MSG-4 meteorological satellite will join four other Meteosat-series platforms that currently are operational in geostationary orbit at 36,000 km. above the equator. After launch, it is to be stored in orbit, ultimately being named Meteosat-11. When operational, it will bridge the gap between Meteosat-10 (launched in 2012 by Arianespace) and the initial Meteosat Third Generation spacecraft – which are scheduled to be orbited in 2019 and 2021. MSG-4 was built by a Thales Alenia Space-led European consortium. The Star One C4 co-passenger – produced by SSL (Space Systems/Loral) – is a part of the third generation of Embratel Star One satellites, which ensure the continuity of telephone, television, radio, data transmission and Internet services in Brazil, in addition to expanding these services to Latin American countries and mainland United States.